Coordinator of Fire Safety & Alarm Systems in Homeless Shelters – NY Fire Consultants Inc. 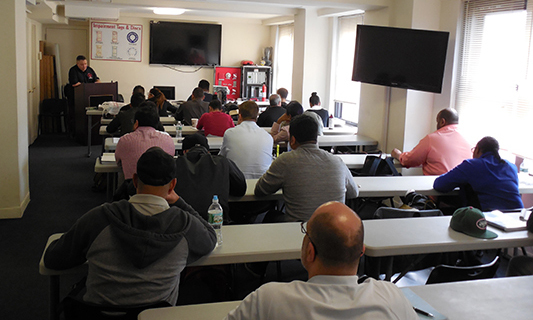 This is the New York City Fire Department (FDNY) approved course for the Coordinator of Fire Safety & Alarm Systems required before taking the FDNY exam. It consists of one 8-hour class that are held as needed. If no date is listed call for the next class. All students should read our Definitions & Terminology document before the first class. Once you have completed and paid for registration of this course, there will be a download link in your Order Confirmation email whereby you can download the document. All homeless shelters require an individual holding a Certificate of Fitness for Coordinator of Fire Safety and Alarm Systems in Homeless Shelters (F-80). This certificate is also needed in any building or occupancy required to have a one-way voice communication system, regardless of occupancy classification, that is operated or occupied by more than 15 persons for a period of more than 30 days, including emergency shelters. Prior to taking the computer-based examination at 9 Metro Tech Center, all applicants shall satisfactorily complete an approved course for Coordinator of Fire Safety & Alarm Systems in Homeless Shelters. Applicants must attend all training classes to be eligible to take the training course’s final examination. School Graduation Diploma will be issued after the candidates obtain a passing score of 70% on the Graduation Test. Download the Definitions & Terminology document which all students should read before the first day of class. Download the FDNY Notice of Examination, which includes the procedures and requirements to become a certified Coordinator of Fire Safety & Alarm Systems. All classes are taught at The NY Fire Safety Institute, in Suite 618 Wyndham New Yorker Hotel, Suite 1130 (8th Avenue at West 34th Street). See below for directions. One class session which is 8-hours in duration.